The screen is decorated to one side in gilt black lacquer with a scene of figures in a mountainous river landscape, with blue and red pigment highlights. This scene is flanked by a mother-of-pearl inlaid lac de bergaute couplet reading "zi gushi ren kua shui bu; jin qishi yang shangong zhi" which may be translated as "Since ancient times poets have been praising Shuibu; when it comes to selecting the (capable) officials one must rely on Shangong". 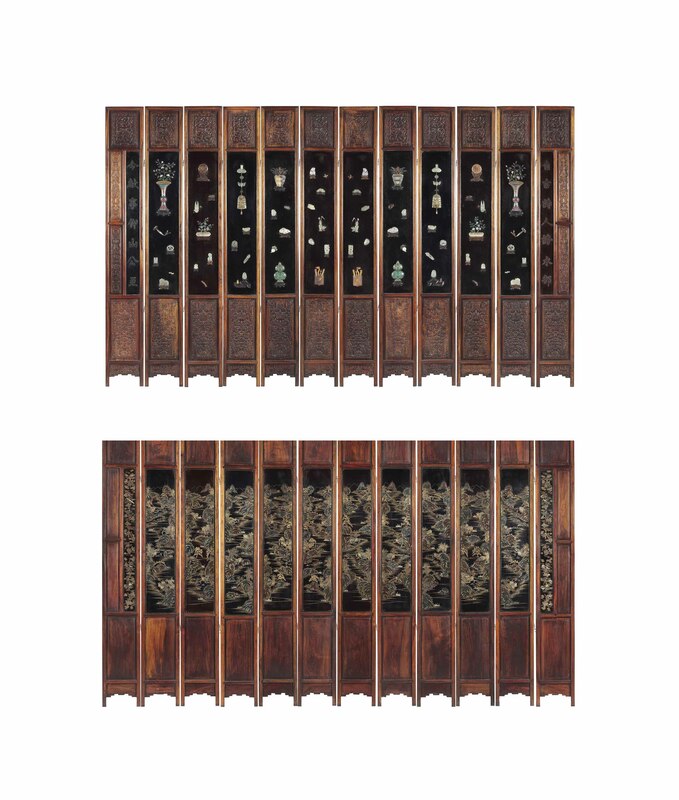 The reverse is inlaid with jade, hardstones, wood and cloisonné enamel in the shape of precious objects. Here, Shuibu is refering to Southern Dynasties poet He Xun (472-519). Shangong, or Shantao (205-283), is one of the Seven Sages of the Bamboo Grove.